Uluru-Kata Tjuta National Park is a striking physical landscape that contains two rock formations which contrast sharply with the surrounding sand plains and desert. The area holds numerous sites sacred to the local Aboriginal people, the Pitjantjatjara and Yankunytjatjara. Uluru (Ayers Rock) and Kata Tjuta (Mount Olga) are isolated remnants left after the slow erosion of an original mountain range. In 1994 Uluru-Kata Tjuta was renominated under cultural criteria, to be recognized as a cultural landscape. It illustrates the combined works of nature & man by making use of the physical constraints and opportunities of the landscape. It also is an associative landscape via the spiritual relationship the Aboriginal owners have with the land. About 80 people still live inside the park and survive by hunting and gathering. This site sees an unbelievable 400,000 to 500,000 visitors a year. All travel for hours just to see these rocks in the desert. You can fly in from Australia's major cities, or drive from the next city Alice Springs (445 kms away). I did the latter, visiting Uluru on an overnight trip and staying in the resort town of Yulara. Yulara itself is a sight to behold: it was only developed in 1975 to keep the tourists out of the park. It has just one loop road, a couple of hotels, restaurants, a petrol station and a supermarket. All are owned by the monopolist Ayers Rock Resort, which keeps prices sky high. I paid 175 EUR for a night in a budget room at the Outback Lodge, the cheapest of the 4 hotels in the area. The room came with a spray can to kill resident pests. I used it. After dumping my backpack at the lodge, I drove straight on to Uluru. Somehow you get the feeling here that there is no time to lose, as if The Rock is calling for you. On the way up I stopped at the Cultural Center for an introduction. It has exhibits about the Aboriginal traditions surrounding Uluru. Like in Kakadu NP, I found these stories and what they involve hard to grasp. Finally I came to the base of the rock. I had a strange sense of arriving at somewhere very remarkable, a WHS with a real Wow!-factor. The attraction is unexplainable however - it might be a combination of its remoteness, the heat and the striking colours (green bushes/red rock/blue sky). This is definitely a WHS that deserves Criterion no. vii: exceptional natural beauty. I walked around part of the base, having a look at the weathered surface and some of the rock painting. Sacred areas are fenced off and no photos are allowed. Climbing the rock however is still possible and many tourists do it. ICOMOS, like the Aborigine owners, advised to abolish this practice, condemning the "intrusive handrail" and "endless procession of human ants". Together with some 80 other tourists I waited for the sunset over Uluru. They even have designated sunset-viewing points here, with ample parking as if in a drive-in cinema. Watching sunset or sunrise is one of the most popular things to do here: Uluru is notable for appearing to change colour as the different light strikes it. The colours turn from ochre-brown into orange, red and finally charcoal grey after the sun has set. The next morning I got up early to see the other rock formation, Kata Tjuta, while it was still relatively cool. Kata Tjuta (meaning: 'many heads', for its 36 domed rocks) lies 35 km west of Uluru. There I started the Valley of the Winds trail, a 7.4 km loop hike. It involves a little climbing and there are lots of loose rocks - not my favourite surface. There are also numerous flies, so you'll loose a lot of energy just swaying them all the time. It was nice to see Kata Tjuta up-and-close though, its domes like bowls of chocolate icecream. For real good hiking in this region, I can recommend the West Macdonnells near Alice Springs. I visited this mixed WHS in January 2018 and spent 3 nights here. By renting a car and buying a 3 days pass, I was free to roam about quite freely within the Uluru-Kata Tjuta National Park. The natural OUV is immediately visible from your airplane as you descend towards the tiny Yulara Airport. The massive red rocks of Uluru and Kata Tjuta are quite impressive surrounded by a never-ending red desert. The exceptional natural beauty of the rock formations and the surrounding sand plains provide rare habitats for a variety of plants and animals. I was lucky (or unlucky) to experience a thunderstorm on one of the days I was visiting. Not only was it an unusual to see small waterfalls coming down of Ayers Rock but during rainfall the red desert is literally in full bloom. A few minutes after the thunderstorm, the flowers practically vanish, while the few puddles that form are filled with tadpoles and burrowing frogs. 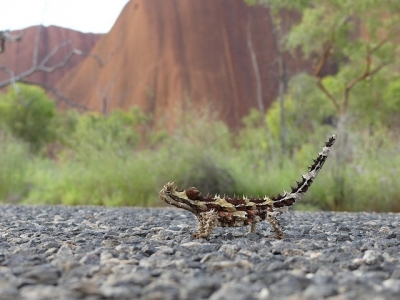 Among the several insects and reptiles, we spotted stick insects, praying mantis, leaf katydids, sand goannas and the peculiar thorny devil (photo). A strong emphasis is made on the fact that the national park is on Anangu land and that Anangu customs and tradional laws are to be respected. Anangu are the traditional owners of this land and living cultural landscape. The land is believed to have been actively managed by generations of Anangu using traditional practices and knowledge. The land is still believed to hold powerful religious and cultural connections today, being one of the reasons climbing will be forbidden to tourists as of 2019, together with safety reasons. Hopefully the ugly handrail will also be removed eventually. Anangu and Parks Australia jointly manage the park. Traditional land management and Western science work together to preserve the park's OUV under the guiding principle of Tjukurpa which is the basis of Anangu knowledge, law, religion, social structure and moral values. For many generations, Anangu have visited the Mala Walk area and lived in it as the Mala people did. Anangu continue to celebrate the adventures and battles of the Mala people through their stories and ceremonies (inma). The animals, plants and Anangu people are descendants of these ancestors, which is why Anangu attach great importance to safeguarding Uluru's biodiversity. The longest Uluru walking track is the base walk which is a moderate 10.6km circuit (3-4hrs long with stops) and is made up of other small walking tracks/sections, namely the Mala Walk (2km return), the Kuniya Walk (1km return) and the Lungkata Walk (4km return). The first two are the highlights with rock art, caves, gorges and waterholes. The only walks which are not covered by the base walk are the Liru Walk (4km) to the Cultural Centre (worth visiting), the Dune Walk (sunset point for buses only) and the Talinguru Nyakunytjaku Walk (sunrise and sunset points). Their highlight is mainly the panoramic view rather than the walk itself. I was determined to go for the Base Walk/Loop. It's wise to carry plenty of water, sturdy waterproof shoes (it gets very muddy especially after rainfalls), sunscreen and a hat with a net against the flies. It's easiest to start early at cooler temperatures from Mala or Kuniya car parks. The hottest time of the day is around 4pm so don't plan to walk in the afternoon. 36 degrees Celsius is regarded as extreme (it feels around 15 degrees more) and certains trails such as the Valley of the Winds near Kata Tjuta or parts of the Base Walk near Uluru are not recommended or even closed during the hottest times of the day. Even though I started earlier I took it very easy and there were times when I was still hiking till around 2pm. It all depends on how hydrated you keep yourself and how fit you are. However, it is not unusual that tourists die here due to heat exhaustion and dehydration so the park's approach is better safe than sorry. Apart from that, as much as 35 people died attempting to climb Uluru. The highlight of the Mala Walk is definitely the teaching cave. For many generations, Anangu elders taught young boys in this cave how to travel in this land and how to survive like adults. Different generations of elders painted in this cave to teach the young boys how to track and hunt animals. They used to teach them where the waterholes are, where to find the animals, where to source materials for their tools and weapons, etc. The colours of the rock paintings come from a variety of materials such as red ochre and yellow ochre from iron-stained clays, black charcoal from burnt desert oak and white from ash. The highlights of the Kuniya Walk are the Mutitjulu waterhole and family cave. Anangu families used to camp here. Men hunted for meat or traced honey ants and women and children collected bush foods. The food was then brought back here to share. The stories passed from generation to generation were based on the Tjukurpa. Desert animals were believed to be like gods or were used to describe stories about the creation of this land and mankind. 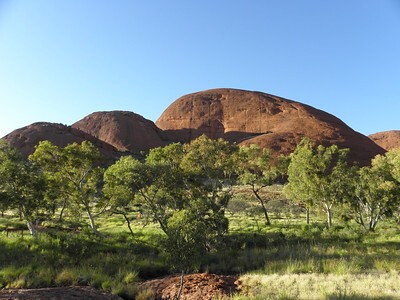 Different features of Uluru and Kata Tjuta were used to recall such stories. The only one I managed to spot was the Woma python woman symbol which is a serpent like 'vein' in Uluru's upper surface. Before reaching Kata Tjuta which is also known as the Olgas (around 30km from Yulara), we visited the Dune Walk viewing platform for a superb panoramic view of Kata Tjuta's 36 dome-like rocks and Uluru on the right. From here it's easy to appreciate the desert landscape with sand plains, scrubland, rocky areas and creek beds. Despite the low rainfalls and poor soils, there's great biodiversity with flora and fauna adapting to survive in this difficult climate. Next, we did the moderate Walpa Gorge Walk, which is a moderate 2.6km return walk on loose, rocky terrain between two of the bigger dome-rocks. Since it was a sunny day and we weren't exhausted yet, we also did part of the Valley of the Winds Walk till the Karu Lookout (another 2.2km return). Having ample time, not only did we visit the rather crowded 'drive-in like' sunrise/sunset parking areas but we also visited the same spots at the opposite times which was rather rewarding from excellent silhouette views and some peace and quiet for a change. We also drove around Uluru's base at sunrise and sunset which was also very rewarding and in many ways better than the crowded parking areas. There is a UNESCO WHS board just before entering and exiting the national park but no inscription plaque. Food and accomodation in the monopoly hotel town of Yulara is pricey and really nothing special but the park is definitely worth the extra effort and money to get/stay here. A few hours on the ground is long enough to feel the energy of Uluru but not long enough to become absorbed by it. Many parts of the site – including the entire northeastern face – are designated as sacred areas because of their significance to the indigenous inhabitants. That means people aren’t allowed to take photos of these areas and so it’s likely you’ve never seen images of them before. These, in particular, are the places that I would like to have spent more time looking at, thinking about, being a part of. 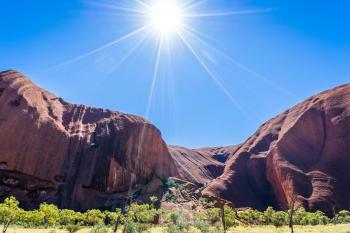 Uluru is one of the iconic symbols of Australia, and for good reason. This desert monolith in the center of the continent is as awe-inspiring as pictures suggest, and I highly enjoyed the time I spent at Uluru and the neighboring rock domes of Kata Tjuta in June 2012. Uluru and Kata Tjuta were not just inscribed as a World Heritage Site for their natural component, but also for their cultural component. To that end I very much enjoyed learning about the Anangu culture through visiting the Uluru cultural center and by taking the Kuniya walk to the Mutitjulu Waterhole at the base of the monolith, a hike that includes views of rock art and displays about desert living. Kata Tjuta also had memorable hiking opportunities, including a trail through a gorge and an amazing walk through the Valley of the Winds. The unforgettable highlight of any trip to Uluru and Kata Tjuta is watching the fascinating range of color shifting on the rocks at sunrise and sunset, and I was not disappointed. Just as spectacular for me was the opportunity to view the vast southern sky at night, unpolluted by nearby civilization and replete with constellations I rarely see. Logistics: Uluru/Ayers Rock is fastest to reach by air, although it is also accessible by road. I recommend renting a car locally to access the various trailheads and viewpoints at Uluru and Kata Tjuta. When I visited Uluru-Kata Tjuta National Park, the biggest question among my group of fellow travellers was "Are you going to climb up the rock?". Many indigenous people hold Uluru to be sacred and should therefore not be a place to climb. 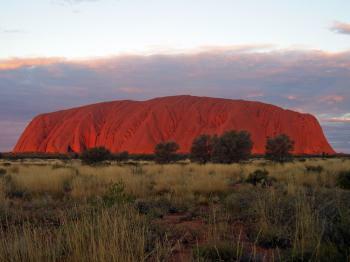 Others are pleased that Uluru is a tourist spot that brings in money. I decided to walk around the base of Uluru and found that I could take in its textures and colours just as well as if I had climbed it. What an eerie and beautiful place! When I went there, wow! I could'nt believe it. If ever there was a monolith competition it would win. The day I was there was cool, rainy, and foggy (and I had thought I was in the desert), but still the mountain exudes a magical charm and is a must-see site. I almost managed to hike around it, but it really was too muddy for that! At least I could understand why people from all over the world make such a fuss about it. Really worth seeing. my name is Drew Kimmorley, I really like Uluru because it is a great place to visit and a great place to just hang out and relax. If you ever get home form work and you want to relax and have fun. Just head out to uluru for the time of your life. Recorded natural discoveries: On 19 July 1873 William Gosse reached Uluru and gave it the name Ayers Rock. Recorded cultural discoveries: On 19 July 1873 William Gosse reached Uluru and gave it the name Ayers Rock. Fatal Accidents or 'disasters': Over 35 tourists have died climbing the rock - many by heart attack! Name changes: The additon of Cultural cirteria being used as a trigger for "name change" - "Uluru-Kata Tjuta NP" was originally "Uluru (Ayers Rock- Mt Olga) NP" in 1989 and the change took place on the occasion of the addition of Cultural Criteria in 1994.